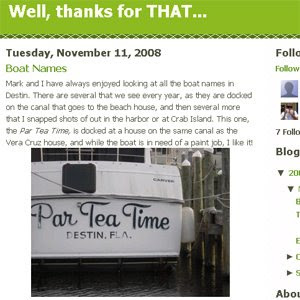 I came across this blog today and found some great boat names - like "Par Tea Time" - that the site's author snapped from her boat in Tennessee. View big pictures of Par Tea Time and boats like it here. By the way, if the captain of Par Tea Time is reading this blog, please contact me and I'll get you a great deal on some new vinyl boat lettering. Thanks for linking back to my blog! Great compliment! One thing, though--we are from Tennessee, but the pics were snapped while on vacation in Destin, FL. There are some great boat names down there!